“If music be the food of love, play on!” wrote Shakespeare, and rightly so, for what is a celebration without music of some kind? Your wedding is an opportunity to blend good food with extra special musical entertainment, so indulge yourself on your special day. Traditionally, music is often played before and during the actual ceremony, while guests are waiting for your photo session to be completed, and during the reception. However, it is entirely up to you. You can organise music to be played throughout the day’s events, or keep it for after-meal entertainment. Typically couples’ choices are strongly influenced by the style or theme of the wedding, and of course the budget. Have you thought about where music will be played by your wedding band? Hunter Valley weddings can combine indoor and outdoor elements, so you may need to check that your preferred musicians are prepared to play outside. It also pays to consider the acoustics of an outdoor venue, because it would be a shame to organise wonderful music that no one can hear properly! When you are getting married in a church, music is often taken care of by an organist and choir, and all you need to do is select the hymns and entrance/departure music. If you prefer not to have an organist play, some churches may be willing to let you hire a string quartet, a trio, or a classical soloist instead. If you have chosen another marriage venue, wider musical choices will probably be possible. While guests wait for the bridal party, they can be entertained by a cellist and violin combination, or perhaps the airy sounds of a harp will set the appropriate mood. Immediately after the ceremony, time is generally devoted to your photographer. Your guests may have to travel to the reception venue, and wait up to 40 minutes before you join them. While canapés and drinks help to bridge the gap, there’s nothing like some background music to help your guests relax. There are a number of choices, including classical musicians, or why not hire a folk band for a contemporary Australian sound? Many couples hire a professional DJ to take charge of after-dinner dancing. All you need to do is make sure your personal favourite songs are included in the play list, along with a good mix of funky dance music, and some more romantic, chill out numbers. 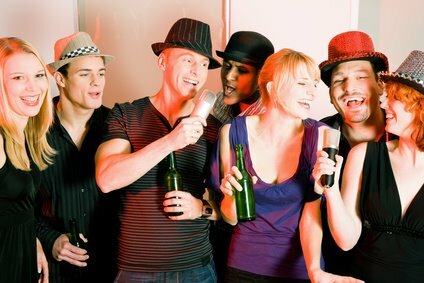 A popular alternative is to hire a great local band for live music, and possibly even a personalised song! Live bands tend to have an individual repertoire, as well as being able to play a wide range of popular dance music and songs. If you’re planning a themed wedding, perhaps Caribbean style, or 50’s glamour, you’ll want music to match, from reggae to jazz. This doesn’t necessarily mean finding a specialist wedding band; Hunter Valley musicians who play regularly at weddings can typically accommodate a great variety of musical requests. So much to do, so little time! Even when your wedding day is some months away, it’s never too early to book musical entertainment. The more popular ensembles can sometimes be fully booked up to a year in advance, so this part of wedding planning needs to be organised early on. Fortunately, Hunter Bride is here to help you find the perfect wedding band. 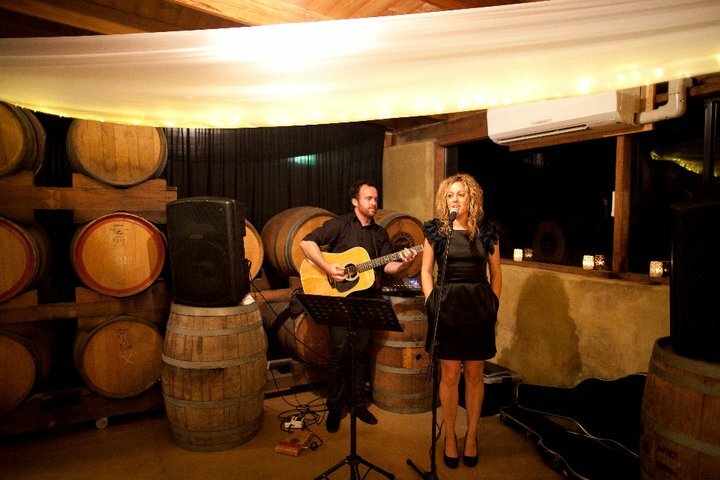 The Hunter Valley is home to a number of singers and musicians, so take a look at our listings to find out more. Music and songs play a big part of your wedding day. Whether it is background music while your guests mingle or a song for walking down the aisle, you will find you are accompanied by music throughout the day. It is because of this that it is so important to find the right band or DJ to help you, as what service they provide can help make your amazing day all that more special. It is a tough decision for some brides and grooms on whether to have live music or use a DJ. A lot of people will get around this by having both, but at different times of the day. Live music for the ceremony lends a very romantic, fairytale feel to the wedding, while a DJ can get the guests up and dancing at the reception after all the official parts of the day are over. Live music can also be great for when guests are having canapés and waiting for the bride and groom to arrive at the reception. 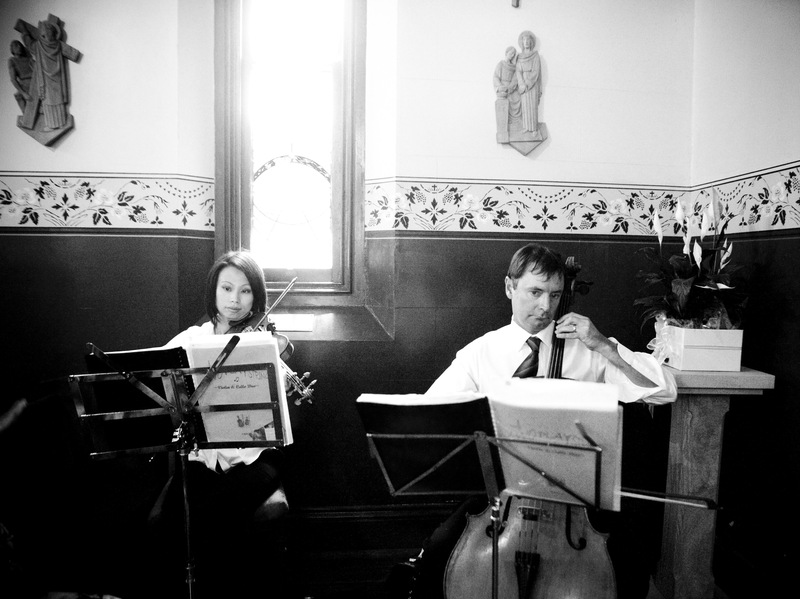 If you are considering having live music for your ceremony, you should speak to the amazing duo Two Play Strings. Dave and Catherine are both tertiary qualified musicians and their experience is evident through their performance. Dave and Catherine play a violin and cello duo, which means their combined sound make for a romantic atmosphere for the start of your wedding day. Through the playing of the strings, they will invoke feelings in the guests at each significant part of the ceremony. There will be expectation and calmness as the guests arrive, excitement as the ceremony is about to commence and suspense as the bride is arriving and everyone is trying to catch their first glimpse of her. Of course at the end of it, there will be joy as the bride and groom complete their vows and become husband and wife. Two Play Strings have a large repertoire of music so you will be sure to find something you like. They can play popular wedding music such as Pachelbel’s Canon and Vivaldi’s Four Seasons but of course their talent doesn’t stop there. They can also play classical, romantic and modern periods as well as jazzy numbers. Every song they play will enhance the emotions of the day. Two Play Strings cater specifically to Newcastle and the Hunter Valley, so they are very familiar with all of the locations of the area already. They can also travel further if need be so make sure you ask about packages outside of these areas. Imagine a gorgeous church wedding in Newcastle or a romantic vineyard wedding in the Hunter Valley with the strings playing softly as your guests arrive. Being accompanied down the aisle by this beautiful music will heighten the mood of the moment, helping to ensure it is one you will never forget. Music and entertainment is an important part of your wedding day. Music sets the tone for the day and enhances the overall experience. If you have the right music or entertainment at the reception, you will have guests moving and shaking on the dance floor late into the night. It is also a guaranteed way to ensure guests have such a great time that they’ll remember it for years to come. In fact, a survey in the US showed that 81% of guests say that the thing they remember most about a wedding is the entertainment and the food! And what better way to make sure your guests remember the entertainment than by having a live band? It is always exciting to hear a band playing your favourite songs live, and The Funky Do Da’s are no exception. The energy they exude will have you and your guests jumping from your chairs to go dancing. The Funky Do Da’s bring both experience and professionalism to any event they are working. 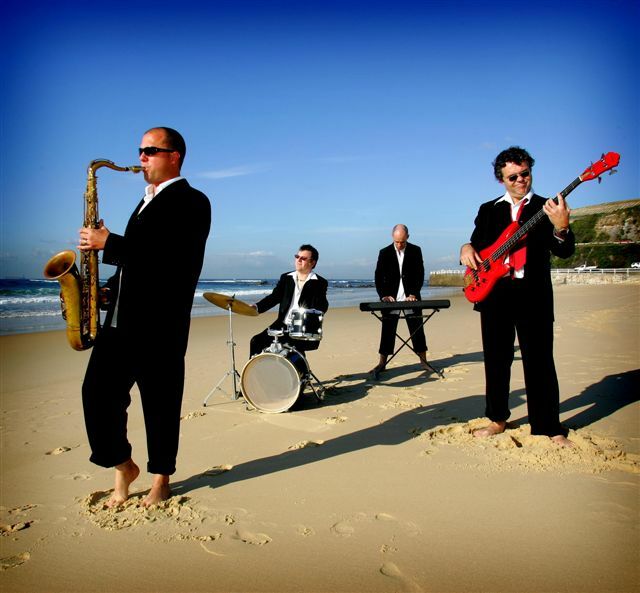 They have been together since 1992 and have earned themselves a name throughout all of Australia by playing at corporate events, jazz festivals and of course weddings. They have even played for the Prime Minister! They are definitely not a one-track band either. Their diverse style in music has seen them perform jazz at various jazz festivals, funky pop at The Queen Victoria Building in Sydney and cocktail music at the Museum of Contemporary Arts. This is great news for your wedding day. This diversity means the band will be able to switch easily from refined music during the serving of canapés, to easy listening tunes throughout dinner and then of course the fun songs to get everyone up and onto the dance floor. Music is the hardest part of any event to cater for all tastes, and if you have varying age groups attending, there is always one group who are not as excited about the song choices as everyone else is. Thankfully, this is no longer a worry for the bride and groom-to-be as The Funky Do Da’s will package up an entertaining song list that caters for everyone, young and old. This means all guests will have a turn up on the dance floor throughout the evening, from the children to the grandparents and everyone in between! And in the off chance this isn’t working, over the years they have become experts at reading the crowd and knowing what needs to be done to get people moving and happy. This may mean upping the tempo or perhaps even putting on a slow, romantic song for the sweethearts. The professionalism doesn’t end there. The Funky Do Da’s are well known for their punctuality, playing music at a volume that is friendly to all guests and for the ease at which they set up and pack up. And if you have something special in mind for your big day, no request is too big or small for this band. They are happy to learn a song for you, provide a microphone for your use and if your wedding is themed, not a problem! They will have the music to match. As with any live entertainment, make sure you take some time out to listen to the band play a live gig, or listen to a demo tape, before booking. We challenge you to get through a whole set of the Do Da’s without tapping your foot along to the beat! You’ve been building up to your big day for months, or dare we say years! There’s been planning, seemingly endless list of things to do, buy and remember, and yes, probably just a little stress. And dare we mention those last minute jitters. The great news is that once the formalities are over the fun part begins. After your beautifully romantic ceremony and the speeches at the reception, it’s time to truly let your hair down. And what better way to do it than with music and dancing. Wherever you choose to hold your reception – restaurant, marquee or dedicated venue – you’ll have the option to organise some entertainment. First thing is to choose a theme to suit your mood, and the day. Is it a morning, afternoon or evening wedding? Is it a formal occasion or a casual, fun affair? When it comes to music, you could just stick to CDS (and may have to in a small venue) but if you want to get toes tapping and hips swinging, a live act or DJ might be the go. A DJ can be great if you’re planning plenty of dancing. Just imagine hearing all your special songs, and retro favourites. If it’s a live performer you want then the choices are many. Will it be a singer and guitarist or a rock band? Need something more restrained and elegant? How about a string quartet? Envision soothing but exciting classical music as a backdrop to your reception, and perhaps even during the wedding ceremony. When it comes to wedding entertainment there are plenty of options. Search our directory and make some calls to find your perfect performer. Ask questions before you book and ensure everyone is clear on what the entertainment will comprise, and when it will begin and end. If you haven’t heard the performer before, ask for a sample of their work on CD. And if you’re looking to book a popular band, book early! What better way to finish your wedding day than with the sound of music and laughter?